Cooking VS. Dining Out #Infographic ~ Visualistan '+g+"
According to Mary Bouchard, Vice President and thought leader at Harris Interactive, "Now, with several years of experience with constrained budgets, consumers have shifted even further from the busy-lifestyle convenience of eating out on a regular basis to making time for cooking at home. When they do eat out, not surprisingly, price is still a primary component of their decision-making process." 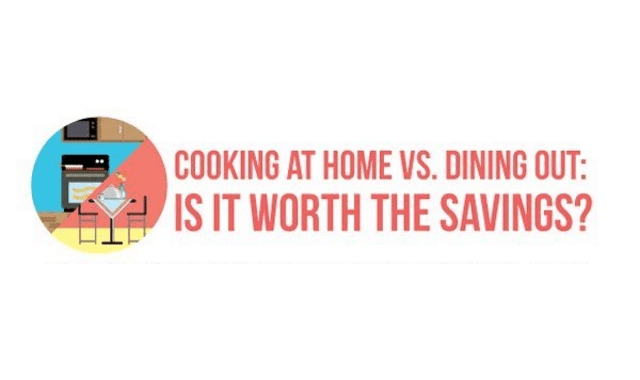 Today, 7 in 10 Americans (71 percent) find themselves saving money by cooking at home instead of going out.